Effective kitchen decorating requires the consideration of many elements, including the material you choose for the flooring. The cabinets, countertops, lighting, and flooring must all work well together to create the appearance you desire. You may have a good idea of the type of flooring you would like to see, but you haven’t quite nailed down the details yet. That’s what we’re going to try to help you with today – the details. Popularity: Trends shouldn’t always be chased because so many things change throughout the years. That being said, the overall appearance or style of the flooring you choose will likely fall within some type of trend; just try to keep it from being too trendy. If you choose tile, for example, don’t choose the most popular simply because it’s popular. Choose something that works best with your individual kitchen. Material: Hardwood, ceramic tile, porcelain tile, laminate flooring, cement… the list goes on. How do you choose? 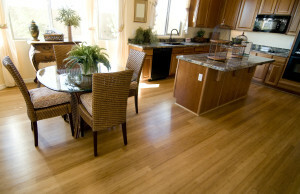 Hardwood is a lovely choice, but it dents when you drop heavy items like pots, pans, or cans. On the other hand, tile can break if you drop something heavy. So choose the material you feel would hold up the best with your family and lifestyle. Design: Every material can be installed using the standard installation methods or in a decorative manner. Choose tile in the standard 12″ squares installed in rows or tile in a variety of sizes and shapes to create a completely unique appearance. Consider using smaller tile around the base of cabinets or around the island to create a nice visual distraction. Color: The color of your flooring should complement other elements of the kitchen as well as help tie adjoining rooms to improve flow. Use and Abuse: The kitchen floor often takes a beating from things being dropped. Cans get dropped on their tops and often leave gouges, dents, or chips. Keep this in mind when choosing your flooring material because you don’t want your 3 year old floor to look like a 30 year old floor. Pets: Pets cause wear and tear on the kitchen floor as well as any other flooring material throughout the home. A five pound Chihuahua won’t necessarily cause a lot of damage to a wood floor, but a 110 pound German Shepherd can cause unintentional scratches simply by running through the house. Location: The location of your kitchen should always be considered when you’re choosing the material and color for the flooring. A stark white or very shiny floor, for example, may nearly blind you if the door leading to the deck allows early morning sun or late evening sun to enter. Trilite builders is a premier kitchen and bathroom design specialist in the greater Phoenix area. We provide kitchen design services to homeowners throughout the Scottsdale, Tempe, Chandler, Ahwatukee, Gilbert, Glendale, and Mesa, Arizona area. Give us a call at 480-895-3442 to discuss your ideas for your new kitchen remodeling project or if you would like help choosing the best materials for your upcoming remodel.